Orrin Hudson helps kick off the New Year! "The place you go when you want to know"
MARIETTA, GA - Winning moves to succeed in life! In this interactive two hour workshop we will look at the challenges facing our youth today and how our free society has created confusion, distractions and the path to bad decisions. Using the game of Chess as a tool, you will experience a solution which is centered on helping youths, amidst the confusion; find a path to successful strategies in life. This requires their buy-in to the knowledge that they have all the capacity within themselves to be productive and contributing citizens. You will take away some simple tools to promote focus, goal setting, responsibility, leadership and creativity. With them you can help young people understand more completely why their personal commitment to their own education is essential to finding their potential and purpose. Orrin C. Hudson, the #1 best-selling author, is a nationally recognized transformational speaker and trainer. 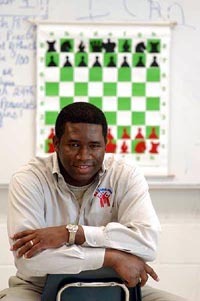 He is a two-time chess champion and President of Be Someone, Inc., a non-profit organization committed to mentoring children and adults, helping them transform their potential into power, their dreams into definite, desired results.